The Citizen Forester program is a community volunteer opportunity for Dallas residents who want to help restore, enhance and conserve our urban forest. Sponsored by UFAC and Dallas’ Parks Department, the program is a combination of classroom instruction and actual field training. This training regimen enables citizens to learn basic tree skills that promote tree plantings in their neighborhood while also advocating the importance of Dallas’ urban forests. Implemented in 2007, the program has already graduated over 50 citizen foresters. Classes typically are held once a month over a 5-month period, and are generally 2-3 hours in length followed by 1-2 hours of field training. Evening and weekend classes are occasionally scheduled but future schedule formats are subject to change. The classes are organized and led by Dallas City Forester. Past speakers included members of the Committee, City of Dallas staff, Agrilife Extension Experts and other arborists and forestry professionals/experts. To graduate, continuous attendance is required. The forester program is open to all area residents, no experience is required and the cost is $75.00 per person. Please note, space is limited but the committee will do its best to accommodate interested residents. 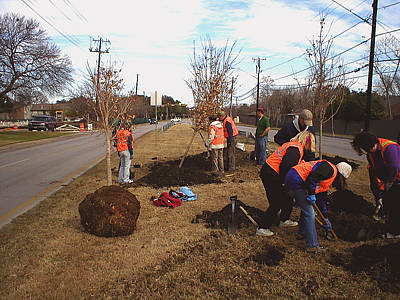 Upon graduation, citizen foresters are required to return fifteen volunteer hours annually back to the city by assisting with a variety of city tree plantings and various tree related projects. They become the eyes, ears and hands for the City Arborists on tree safety and hazards issues. Moreover, Citizen Foresters are taking a greater role in public education about trees.